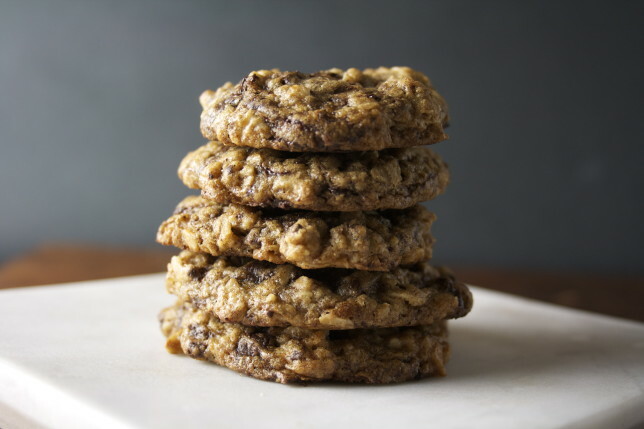 These may be my favorite cookies after the brown butter chocolate chip. It’s interesting to read through other people’s blogs and see their favorite ingredients shining through in recipe after recipe — buttermilk, whole wheat flour, smoked sea salt. For me I guess it’s oats, at least for now. 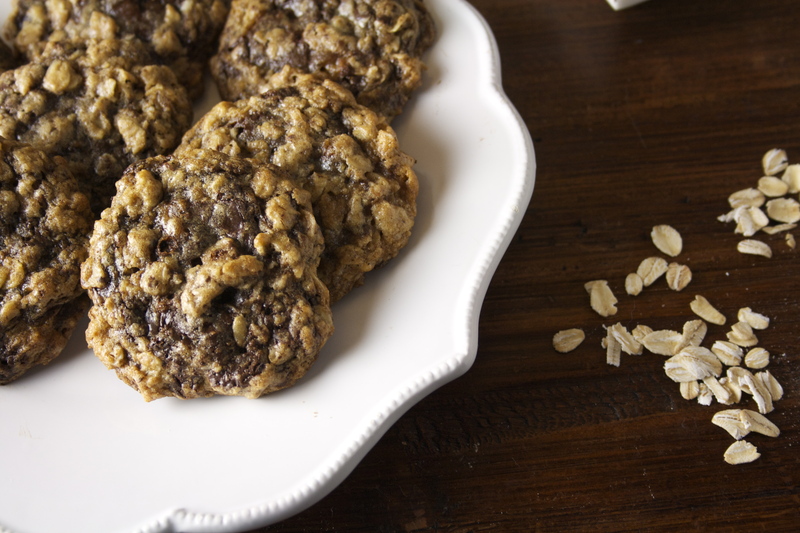 I love the texture softened oats give a cookie, the flavor they impart to a muffin or a scone. Because of the relatively low amount of sugar spread throughout what typically yields about 5 dozen cookies, they almost seem safe to eat for breakfast — a quick little bite when you’re starving but want to get a run in before a real breakfast at home, or a bigger one when you sit down with your coffee at work (or am I the only one who does that?). These are thick, soft, and chewy, even three days after baking. And can we talk about flavor? Can we talk about the chocolate? In these I’ve chopped up a whopping 12 ounces of bittersweet chocolate, which never seems to be that much when picking up a bag of chocolate chips, but looks like much more when chopped into big chunks, small chunks, and thin shavings, and heaped atop your cutting board. The different shapes and sizes of the chocolate means it’s layered and well interspersed throughout each cookie. They become more of an amalgam than a pairing. And the cinnamon. Oh, sweet, floral, spicy cinnamon. 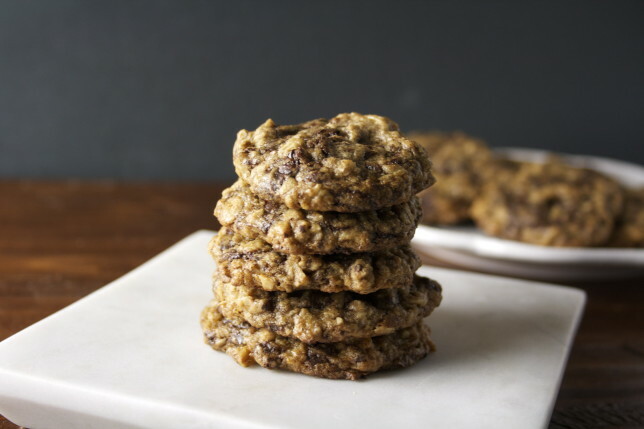 It’s what marries the flavors of the oats and the butter and the dark, rich chocolate together to create the most perfect little morsel. I guess all parts of these cookies are grounding. All parts came from the earth. Thank goodness there are — okay, fine, were — more than 60 cookies to temper the electric current coursing through my body and my mind. 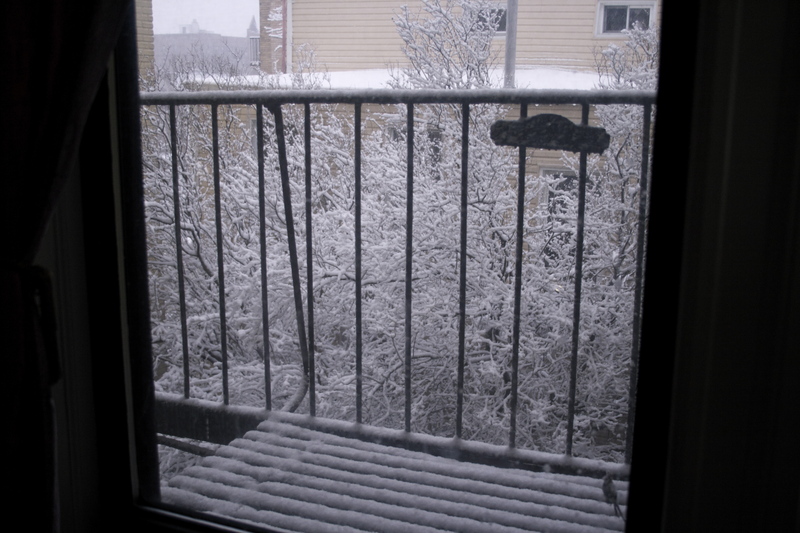 This spring, I think I’m gonna need them. I’m a huge fan of chopped chocolate in these cookies, and my go-to is Trader Joe’s Pound Plus Bars, specifically the 72% bittersweet from Belgium — it’s incredibly economical and it’s damn good chocolate. Very dark, smooth, and complex. But if you can’t get your hands on it or another kind of bar (go as dark or sweet as you’d like), or if you just don’t feel like chopping, of course chips will work. Just make sure you get some good stuff. Do it for the cookies. Preheat oven to 375 degrees with a rack positioned in the center. Line a baking sheet with parchment. In a medium bowl, whisk flour with baking soda, salt, and cinnamon. Set aside. In a large bowl, use a hand-mixer to cream butter with brown sugar and granulated sugar until lightened in color. Add vanilla and egg and mix on low speed until combined. Add flour mixture and stir with a spoon until combined. Stir in oats, ensuring that all are moistened. Fold in chocolate. 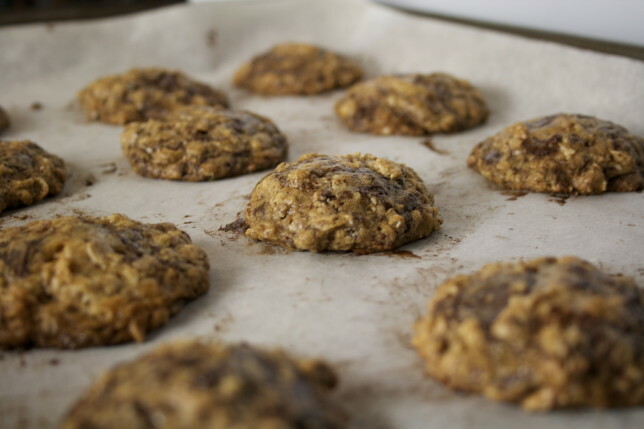 Drop by the tablespoon onto prepared baking sheet. Bake for 8-10 minutes, or until the edges have begun to set but the center is still soft. 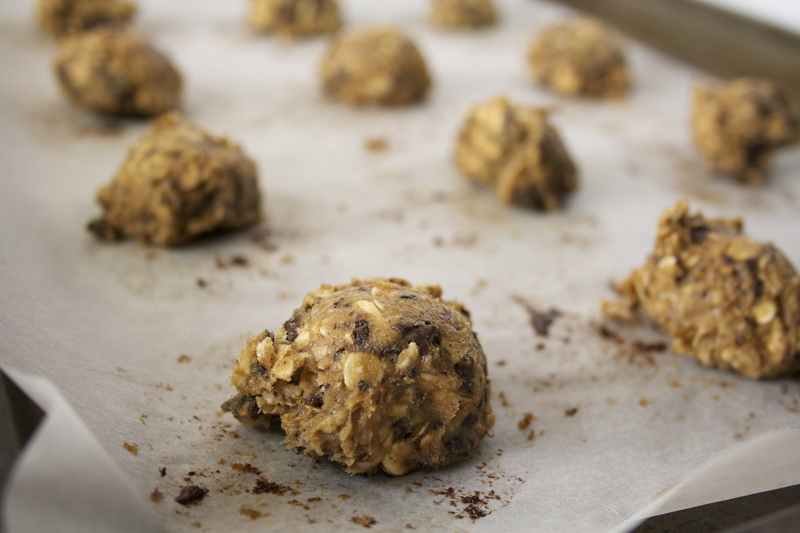 Let cool for five minutes on baking sheet before removing to a cooling rack to cool completely. Sarah, I have to tell you these cookies are amazing! I had some friends in for dinner recently and one of them brought a basket of cookies. When we all raved over them she told me it was my friend, Sarah’s recipe! She and a few other friends subscribe to your blog! Small world and now your cookies are famous in New Hampshire! Wow, it is a small world! High five to your friend who baked them up! So glad you love them. I wish I had some right now! 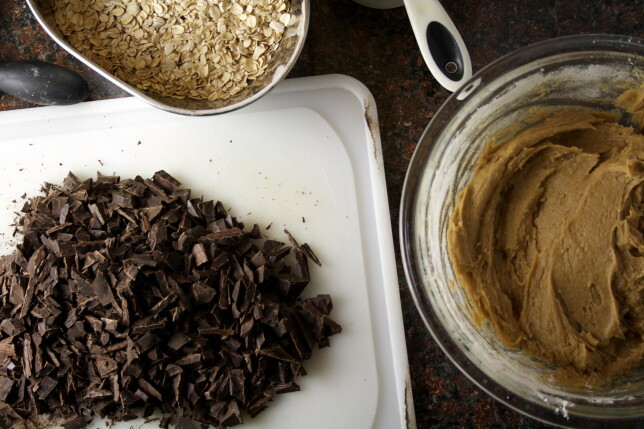 Did you use quick cooking oats or regular? Hi Maureen, thanks! I use regular, old-fashioned rolled outs for these guys, mostly because they’re what I always have on hand. I’m sure quick cooking would be great, too. Enjoy and let me know how they turn out!